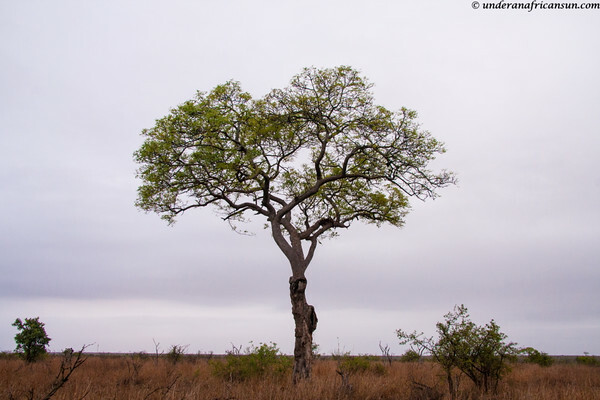 A few weeks ago I was lucky to spend an amazing 10 days travelling solo through the Kruger National Park. You may remember I took my first solo trip earlier in the year and wrote about it here, and here and here. The Frenchie was unable to get any time off of work and since I had such a great trip the last time, it was an easy decision for me to return. I have a lot of stories I hope to tell, but I want to start off with one of the most amazing safari experiences of all time for me. Something was hanging from one of the branches. I grabbed the binoculars and saw that it was a rather large (and very dead) warthog. This poor fellow had been gutted and dragged up the tree, out of reach of other predators. 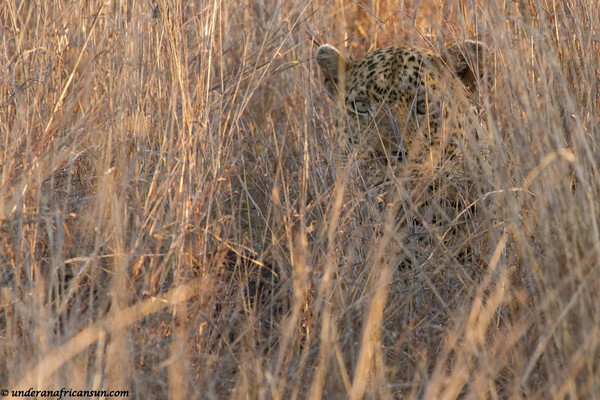 Only the very elusive leopard is known to do this and I quickly started scanning the long grass for any signs of the cat. 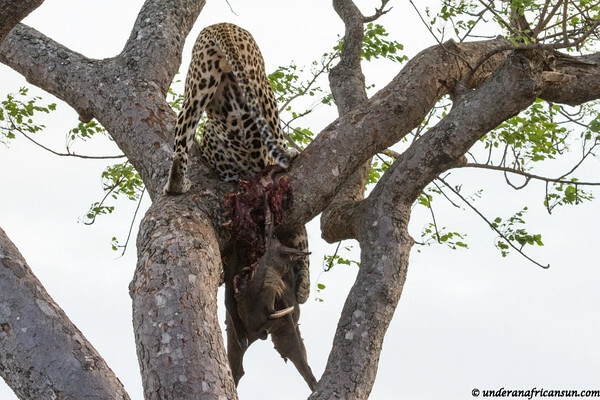 It didn’t appear that much of the warthog had actually been eaten so I was hopeful the leopard would be back to have his dinner. I waited awhile, scanning the nearby trees as well but this cat was nowhere to be found. Warthog. Sorry for the graphic photo but I found it fascinating how the warthog appeared to be so expertly sliced open. I decided to continue my morning drive and worked out a new route that would have me loop back around several times to see if the leopard had returned. These efforts yielded no results and on my last pass-by, I chatted with a couple who thought that there was a good chance that the leopard would return in the late afternoon, after 4 pm or so. 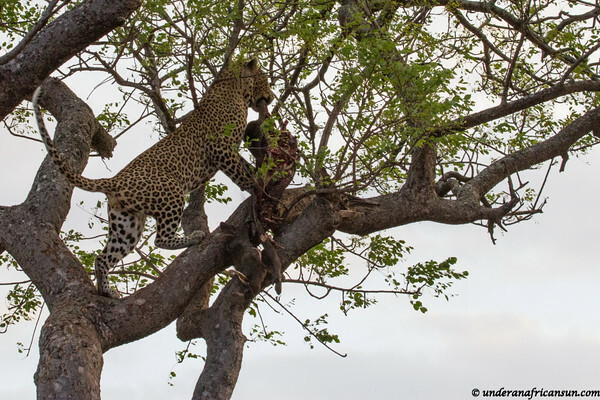 As I headed back to camp to prepare for the guided drive and bush braai I had booked for that evening, I was already planning to ask the guide if we would be able to return to the tree to see if the leopard would make an appearance. At 4:30 pm I met with the group. 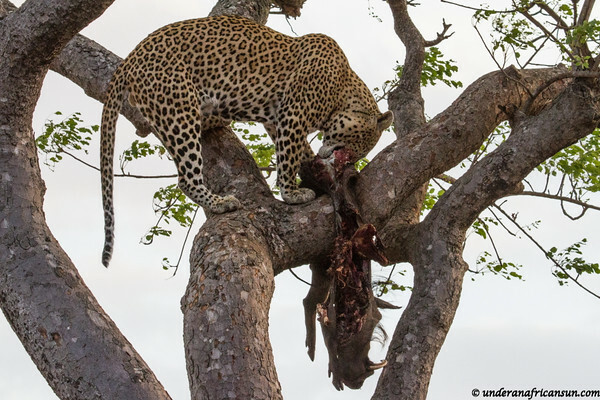 We would be doing a 2 hour safari drive prior to our bush braai (this is dinner out in the bush in an unfenced area, just an incredible experience). I told the guide about the warthog and he said we would go check things out, maybe we would get lucky. 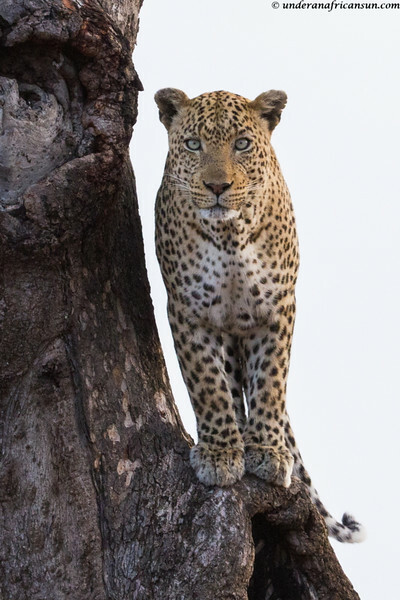 I was anxious to get back to the tree, however the guide organized this to be towards the end of drive, probably to give the nocturnal cat more of a chance to show up. After about an hour and a half, and just a couple kilometres from the tree, our guide stopped the Jeep to talk to another vehicle coming from the opposite direction. I couldn’t hear the whole conversation and only got bits and pieces as I was in the back of the Jeep. 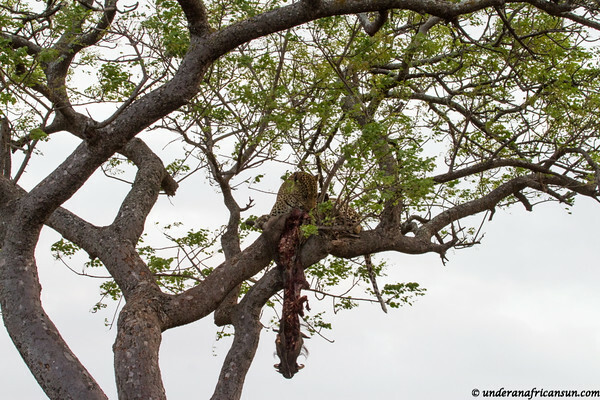 I knew they were talking about the leopard but I couldn’t make out if it was still there or maybe it was only the warthog in the tree. Off we went to to the tree. 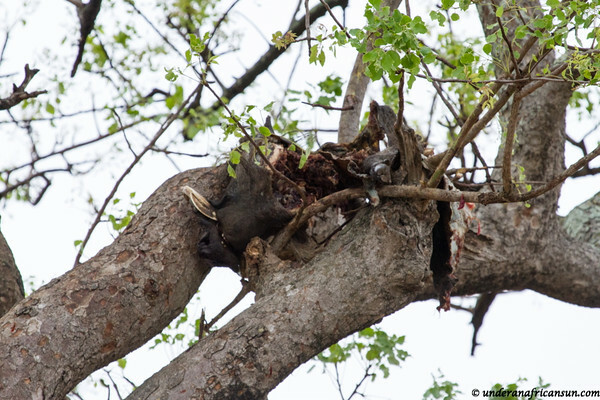 When we arrived, I wasn’t even sure it was the right tree as the warthog was no longer hanging from it. Another car explained where to look and all of a sudden we could make out some well-camouflaged spots amongst the tall grass. And there he was. We had finally found the cat that had alluded me the entire day. Not the clearest sighting but any glimpse of these cats is always a privilege. Our group was thrilled and we went off full of smiles to an unforgettable dinner in the bush. But this was not the end of my adventure. Fast forward to the next afternoon. I was returning from a long day out driving and since it was on the way back to camp, I decided to drive past the tree again, you know, just in case. I arrived around 4:45 pm and there were a couple of cars sitting in front of the tree. My excitement grew and I positioned the car with a direct view of the tree from my side. The car in front of me was just sitting and scanning the bush and then they pointed out something just under the tree. 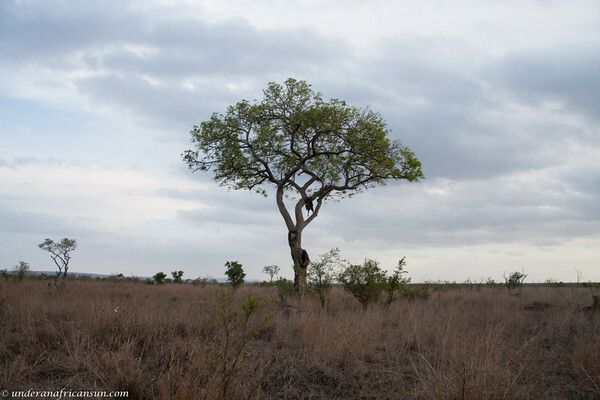 At first it was hard to see, but I finally made out that there was a hyena asleep just to the left of the tree. 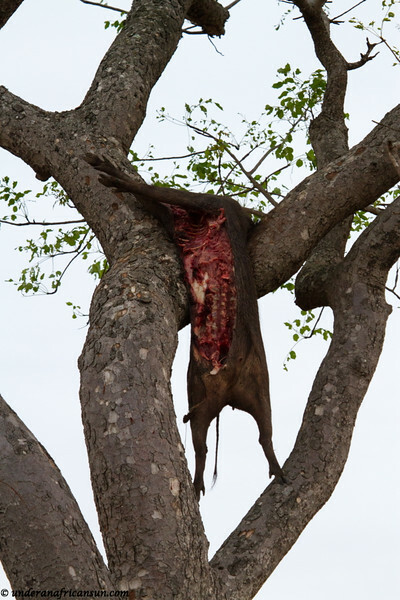 And to my surprise, the warthog carcass was now back up in the tree, or should I say what was left of it. I didn’t have to be back at camp until 6:30 pm so I settled in to wait for the leopard to make an appearance. The car in front of me was facing me, so I figured we would be able to keep watch from all sides. 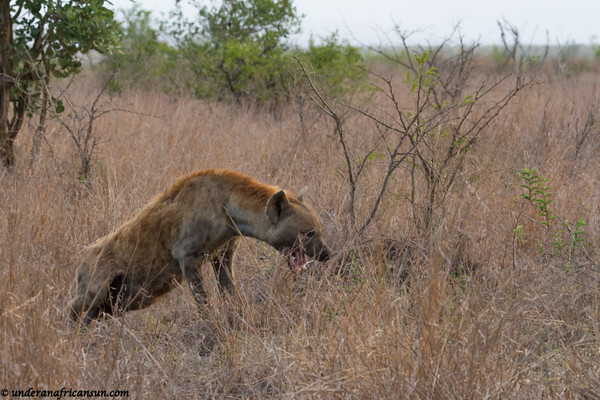 Then there was the hyena who I assumed would see the leopard long before we did so I kept watch on him as well. I was a bit nervous thinking about the cat sneaking up from the other side of the car, but not nervous enough to put the passenger window up. And we waited. And watched. And waited. Around 5:45 all the other cars decided to make their way back to camp. I chatted briefly to the couple in front of me and I told them I would wait until 6 pm, giving me enough time to get back to camp before gate closure. They wished me luck and off they went. And then I was alone. I started to feel a bit silly just sitting there, probably waiting in vain, but I really didn’t care. I was also still a bit nervous and I put the passenger window up. And I waited some more. Not even 10 minutes later, my eye caught some movement just behind the tree. 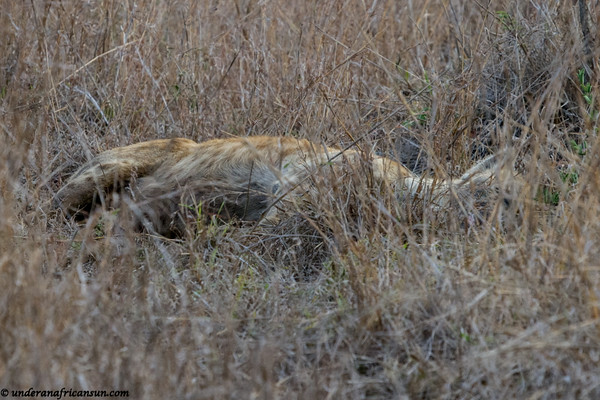 I glanced at the hyena and he still appeared to be sleeping. 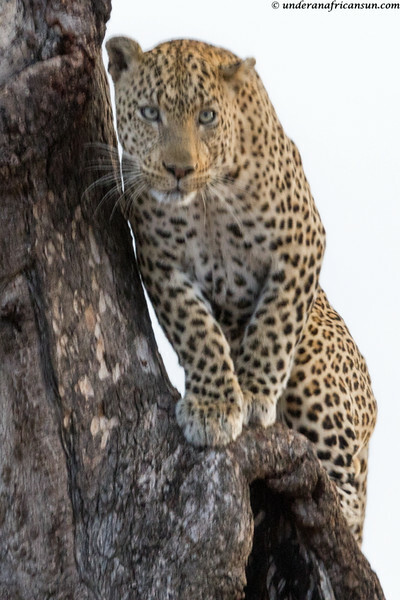 I looked back again behind the tree and I see this spotted face coming towards me out of the bush. 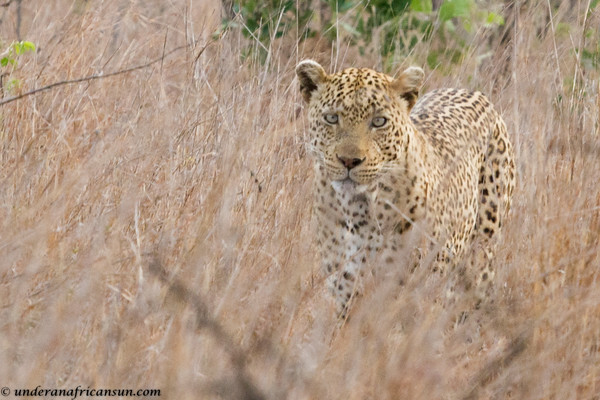 The leopard was about 30 meters from me and as he slowly emerged from the bush, his eyes were focused directly on me. I stared in disbelief as I fumbled around with my camera. What if the leopard took off running at full speed towards me? Would I be able to get the window up fast enough (probably not)? Leopards are not known for attacking people in cars and luckily my photographer’s instinct kicked back in and I was able to calm down and start shooting. I honestly couldn’t believe what was happening. 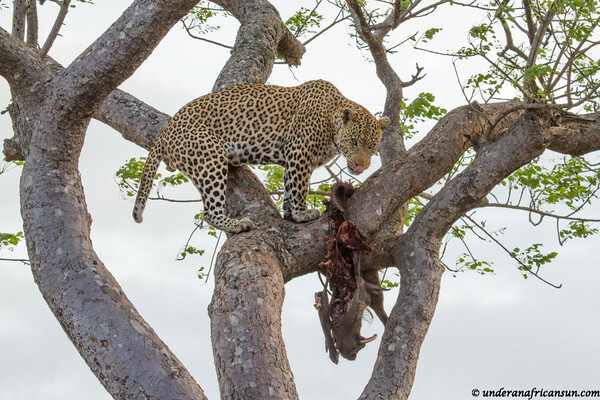 The leopard made his way out of the bush and sat under the tree for a couple of minutes, his eyes darting from his kill in the tree, back to me and finally over to the hyena who still hadn’t budged. 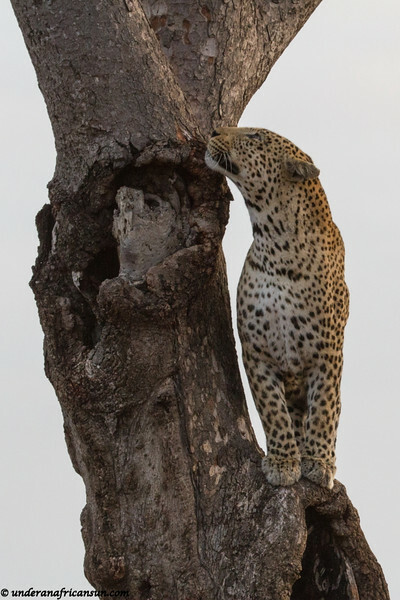 The clock was ticking on me being able to get back to camp on time when the leopard finally made his grand leap into the tree. What an incredible cat. 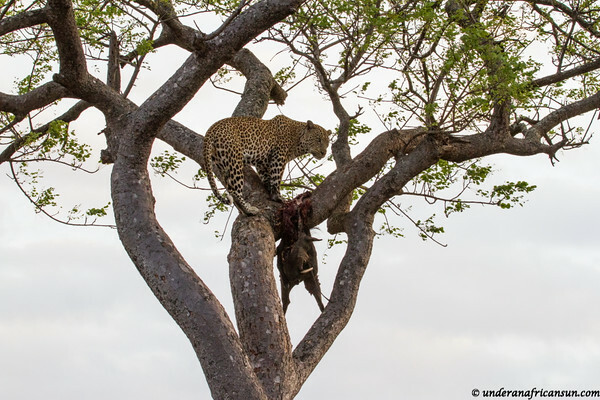 I watched in awe as he climbed the tree and proceeded to drag the warthog a bit higher up. So agile, so strong. So amazing. It was now just after 6 pm. I knew there was little chance that I would ever see anything like this again and I quickly recalculated the time needed to get back to camp in my head. I gave myself 5 more minutes to spend, knowing I was going to be cutting it close. Real close. 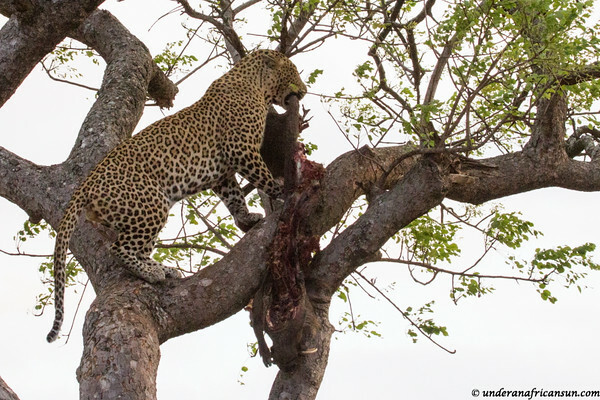 Once the leopard was satisfied with the new location of the warthog, he calmly started feeding. 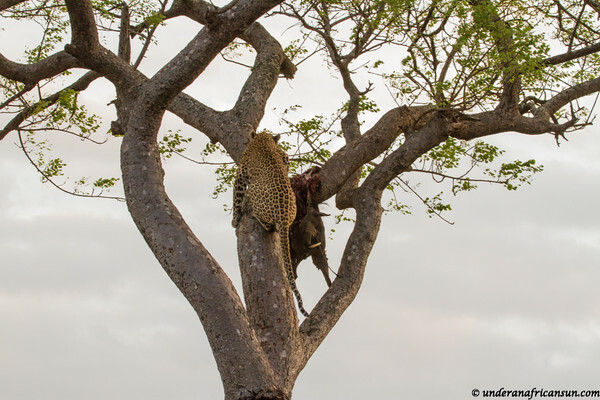 Assured that the leopard was now busy in the tree, the hyena finally got up and repositioned himself directly under the leopard to catch any stray morsels falling from the tree. And then I had to leave them. I didn’t want to spoil this wonderful experience with a hefty fine back at camp so I shot one last photo and off I went. The only thing to do now was hope there would be no elephants blocking the road. With the kind of luck I have I figured my chances to be about 50/50. I was relieved to make it back with about 2 minutes to spare and no elephant roadblocks. I stopped at the petrol station back at camp and the couple that had been parked in front of me were also there. I felt bad they had missed it but I had to tell them my story. They were happy that I got to experience such a special sighting. 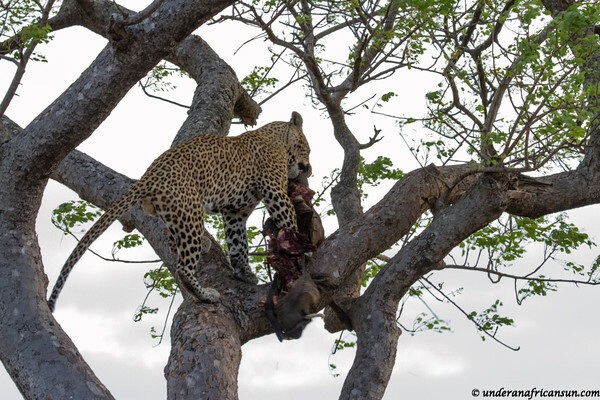 I did return the next morning and there wasn’t much left of the warthog and the leopard was nowhere around. I continued on my drive and ended up a few kilometres down the road at a lion sighting, with only one other car which just happened to be the same couple from the previous night. At least we both got a nice sighting this time. 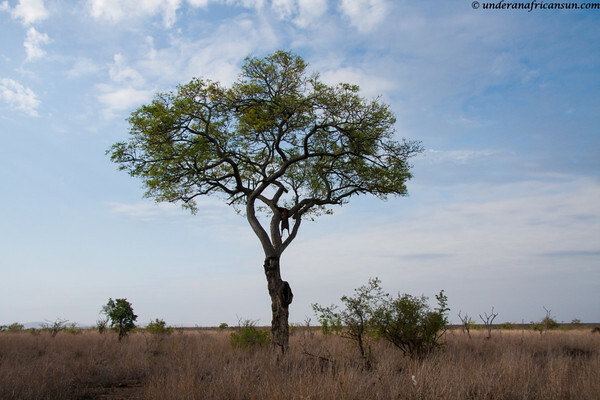 At the end of the day, after a long day of driving, I returned to the tree one final time and the tree appeared to be completely cleared of the warthog. My story had come to a close, but what an amazing one it was. Kruger just becomes more and more special on each visit. I can’t imagine ever tiring of visiting the park as each time feels new and different and oh so exciting. I have many more stories to tell soon of my latest adventures so stay tuned. 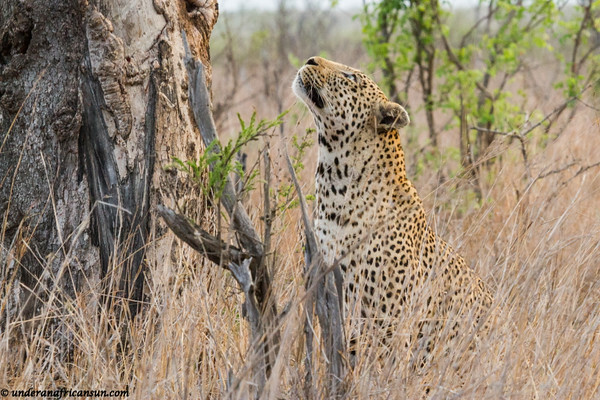 This entry was posted in Safari, South Africa, Wildlife and tagged Kruger, Nature, Reserves, Safari, South Africa, Wildlife by UnderAnAfricanSun. Bookmark the permalink. 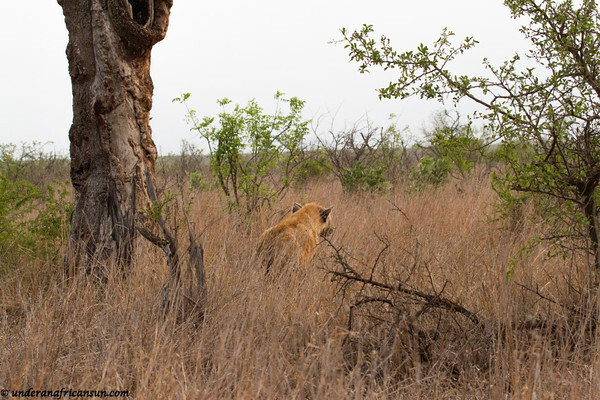 What a fantastic and magical Kruger sighting! And every time you pass that tree in future you will be reminded of it again. Two more sleeps and then we’ll be heading back there again. I can’t wait. Thanks! It was such a great trip. Can’t wait to hear about yours. Have a great time! This is just amazing, Kelly! Also, I think it’s so cool that you go on safari by yourself. Thanks Heather. Sometimes I feel a bit guilty that I have so much fun alone on safari too, but it has been such a good experience for me. Cool sighting, wish I’d been there! I love watching how these things develop over time. Thanks so much Roxanne. 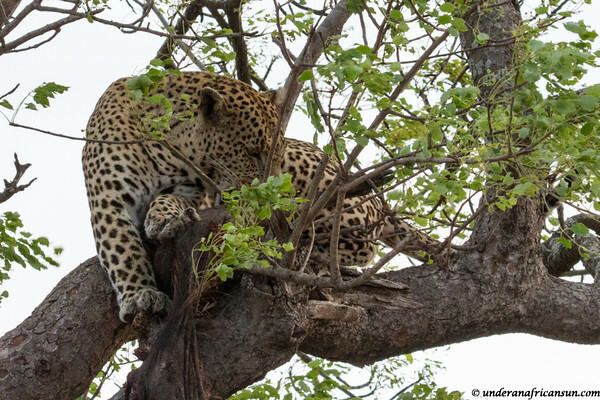 Yes it was so much fun to try and find the leopard and then to get such a great reward for being patient.